The SLOLS has been made by Zeriab. The purpose of SLOLS is to provide the player an opportunity to interact with something during loading sequences. I think the loading time will not seem as long as normally if the player as something to do while the program is loading. They don't experience the time it takes to load as bad even though the script reduced the loading speed. 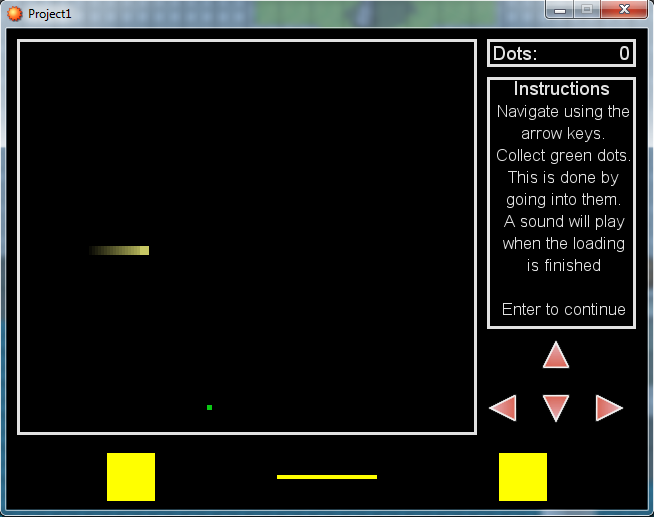 In the game itself the principle is to collect dots by moving a bigger dot into them. There is no time limit. There is no way to die or get stuck or etc. Steering is done by the arrow keys. When the loading is finished a sound will be played and visual aids will be used to let the player know that the loading is finished. There is no need to press enter. The player can play the game as long as he or she wants unless the script loaded does something that changes this. The demo has been combined with my Letter Ninigame to show a example of use. If the Letter Minigame is used credits mentionen in the Letter Minigame should be given. This script used the global variable $loader. It can run without $loader being initialized in which case the script considers the loading as done. scene will be used to set the scene that comes after Scene_SLOLS. The scene to be used after finished loading and player pressing trigger. There also are the Margin (in pixels) and the Border_Thickness (in pixels). Changing these may break the design. The info bar with the instructions is a bit fragile. Should be independent which increases compatibility. I would like to thank everyone using their time to try and use SLOLS. I would like to thank everyone reading this topic. I don't recommend letting the script being 'loaded' change the $scene as makes the SLOLS stop rather suddenly from my point of view (Players position). I still love it, maybe I'll make it a bit more colorful. Do ask if you have any problems with using it. Noooo I can't dl it for some reason. The first time it seemed o work but I guess my internet just failed at the very end. I hope this will help you. I can't find a working link for the demo, so hopefully Zeriab will come and save the day with that. I uploaded a temp demo of this. ^-^ Aww, thanks to the both of you! EDIT: I checked Juan's temp demo out, and it's awesome! Thanks Zeriab! Edited this script so it will load windowskin arrows if no arrow images in Graphics/Pictures. # Sleeps a short while to let the other thread work. # Prints the exception if in Debug mode. # Removes any old contents, garbage and so on. # Draws a black block on the white block creating the border. # The amount of cheese caught during this season. # Does not consider the size of the cheese. # cheese the player must be touching the cheese. # or returning from the item screen to the main menu.